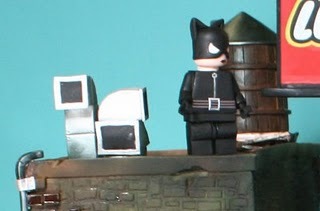 Cake Wrecks - Home - Sunday Sweets: Leaping Lego Lizards, Batman! 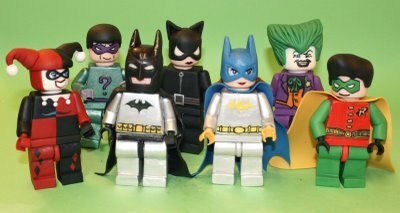 Sunday Sweets: Leaping Lego Lizards, Batman! 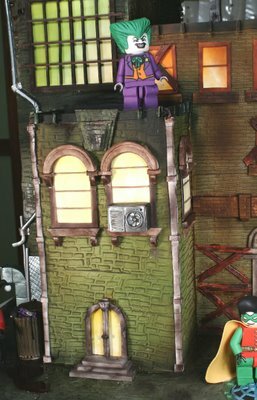 I've got a Geektastic Sunday Sweet for you this week: the cake made for the Lego Batman video game premier. These photos come from creator Elisa Strauss over at Confetti Cakes, who reports that the cake took her and her team 12 straight days to complete, and weighed in at nearly 300 pounds. Three hundred pounds, people! So, you ready to see it? Yep, it's all cake - vanilla cake, chocolate cake, and red velvet cake, to be precise. Don't you just want to gnaw off that water tower? Or is that just me? Let's move in for a closer look, shall we? See, now this is the stuff you never notice from a distance: there's an oil slick puddle on the side, and the trash bags are even shiny! The water towers are wood-grained, and the "stone" is even chipped in places. Wowza. I know you're going to find this hard to believe ('cuz I sure did), but the figures are also completely edible. Honest. Elisa, I'm pretty sure I've never wanted to hug a cake before now. Can I have this little guy in plush? Or at least a desktop figurine? Please? Check out Elisa's book on Amazon here. UPDATE: Click here to watch the Batman cake being made! Wow that cake is amazing. Both of them are amazing! Sometimes I want to hug cakes to. 12 days! Sheesh that cake would be stale by the time its fully decorated... Its also too pretty to eat anyway. 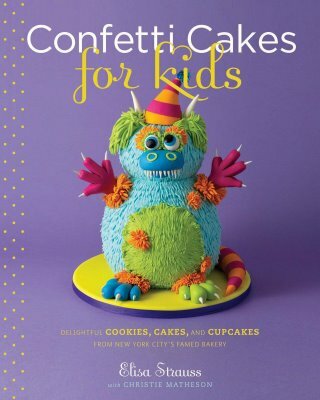 I love the monster cake too! My boys LOVE the cake. Wow, the people who worked so diligently on the details should be surgeons! My hand is never steady enough to do such minute and perfect detail! Beautiful! My son will flip when he sees this! Sunday posts are my favortie. It's like a little vacation from eveyday life to see these beautiful creations. I don't know if I would have the heart to eat any of them. I would love to have a set of sugary lego characters hanging around. Thank you for your beautiful Sunday posts! My God. Not since Val Kilmer have I wanted to eat Batman so badly. It's amazing, and at the same time, the critical part of my brain finds it weird that there is a cake representation of a Lego representation of a game representation of a movie representation of a comic book. That book cover is amazing! So cute! Gotham never looked better...I love whne you share the fabulous cakes too! I have an event next week, and I am hoping to have NOTHING to share with your blog afterward. Great craftsmanship. But does anyone eat a cake twelve days old? I am emailing this picture to my nephew! He's gonna love it! Great find! Outstanding cake. My children are already crazy for Cake Wrecks, when I show them this Lego inspired creation they are going to be over the moon! Thank you for sharing this Sunday Sweet. How could anyone eat these? How?! I want Harley Quinn!!!!!! Mmm, twelve-day-old cake. Just what I want to serve my party guests. The art is beautiful, but if it isn't fresh and tasty, it doesn't count as cake, IMO. Love that Batman cake. I'm actually giving away 5 copies of her new cookbook! Enter http://beantownbaker.blogspot.com/2008/10/cookbook-review-and-giveaway.html" REL="nofollow">here. I love cake. And I love to see these types of cakes that are amazing works of art....but I am with all the other posters who think a 12-day old cake just isn't appetizing at all. Golly. I'd hate to be the first person to cut into that. I wonder if there are photos somewhere of it being demolished and devoured. Nothing's saying the cake ia 12 days old. I'm guessing most of the time was spent making all the little fussy bits. Even so, cake enclosed in fondant has an amazing shelf life. These ain't yo mama's sheetcakes with buttercream. OK, I got to thinking. The 12-day thing includes making the figures. They probably made all the frosting pieces first, made the cake last and assembled it. It's not a 12-day-old cake, it just took 12 days to make all the stuff. holy batman that's amazing! up until now, i've loved duff goldman.. but looks like i may have another new cake maker to love! wow! Anything but a wreck, huh? Gem's got it right, folks: it's not like they baked the cake first and THEN took 12 days to decorate it. Fondant and sugar details can be made ahead of time. I have no doubt the cake was as delicious as it is gorgeous. It's an absolutely stunning cake. Wow wow wow!!! How big is that cake? It's 300 pounds, and cake isn't all that heavy. Is that cake the size of a city block? Is it 1 foot tall or 3 feet tall? I don't get a sense of perspective from the photo. Argh! The impermanence of such art makes me feel sad. All this for something that is built to be destroyed! I feel the same way about beautiful chalk art done on sidewalks. I feel guilty walking near them. And I could never, never take a bite of this cake and participate in its destruction. I was totally imagining myself biting off the water tower... then I read your marvelous comment about gnawing it off. 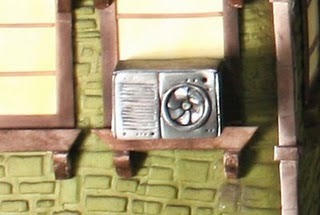 Right down to the fans on the window air units! Incredible detailing. What a work of art. Elisa Strauss, was she the one in all the Food Network cake competitions? With the sock monkey cake? The cake looks fabulous, and the details are amazing...but I wouldn't want to eat a cake that is 12 days old! Juliet - If you go over to the Confetti website there's a link to their video of the cake being cut, so you can see what it looked like scaled to human size. I think it's about 3 foot tall. Wow...totally amazing. Wonder what that oil slick tastes like? I saw that a couple of people said the cake would be stale in 12 days. Actually it wouldn't. I don't know the chemistry to it but the fondant "seals" the cake up & makes it moist & delicious! Plus the cake was probably stored in a fridge. I have never before wanted to gnaw on a building like I do right this very moment! WOW another masterpiece work of art. When cakes like this are done right, they deserve wing at the Met. I really want to bite the heads off of those little lego characters! I can see why. 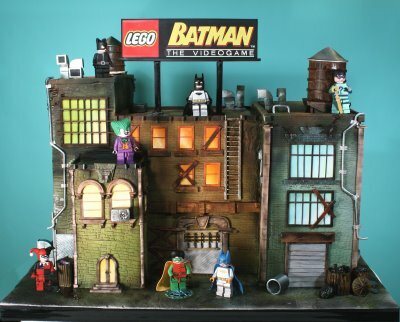 The Lego Batman cake is amazing. Amazing. Well, short of the infamous baby cake. But that one was just creepy. That monster on the cover reminds me of these awesome little customized plush monsters at this site: http://www.curlyqcuties.com/. I don't have anything to do with the site; I've just wanted to order them for my kids! I've held off, though, as it already seems our house is overrun by stuffed animals. That's an amazing cake but....i kind of don't get the point. They worked on it for twelve days? It'll basically taste like sawdust and glue when it's finally 'served'. Blech. I'll take a made-from-box and home-made-cream-cheese-icing cake *any* day over one that someone poked and prodded and touched for *twelve days*. wow! That is an awesome cake! And I love the monster too! There's one thing seriously wrong with this cake. It's not in front of me so I can eat it. Well...it's not a bad effort, I suppose. Edible doesn't necessarily mean tasty though... my amateur opinion is that the figurines are made out of gum paste (a sugar paste that hardens when it dries), which I've eaten once and it was not tasty, didn't taste sugary just crunchy and kind of yucky. But it's awesome that they COULD be eaten if you wanted! 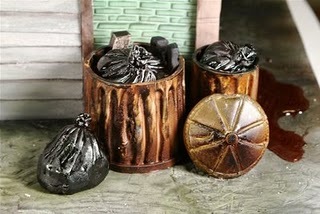 http://www.eatdrinkordie.com/blog/posts/3592 have you seen this about divorce cakes? I'd think a post on these would be right up your alley! My boys and I are loving your Sunday posts. Last week, Mario. Today, Lego Batman. Fun, fun, fun!!! Holy Cake, Batman!! That's the most awesome cake EVER!! !